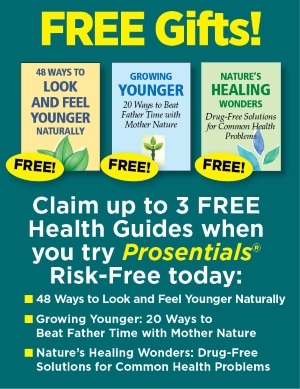 October 27, 2017 By Dr. William S. Gruss, M.D. It looks like frequent hand washing or covering your mouth when sneezing may not be the only way to protect yourself from catching a cold or the flu. Researchers at the University of Wisconsin-Madison have uncovered an unexpected way of preventing these all too common maladies -- one you may have never considered. The focus of the study was intended to discover how to reduce the incidence of employees taking sick days during cold and flu seasons. Sick leave amounts to billions of dollars to businesses and society in terms of lost production and healthcare costs. There were 149 participants, randomly split into three groups, which were then studied for a total of nine months. One group consisted of participants who meditated on a regular basis, another group exercised regularly and the control group neither meditated nor exercised. The exercise and meditation groups took classes for 8 weeks, one for meditation and the other for exercise. They were then asked to keep up their activity regularly for several months afterwards during the peak of Wisconsin's cold and flu season. The results were telling. Among the group that meditated, there were 27 bouts of colds or flu. The exercise group had 26 bouts. The group that did neither had 40 bouts. What's more, the inactive group missed 67 days or work, the exercise group missed 32 days while the meditation group missed only 16 days. "The results are remarkable; we saw a 40 to 50 percent reduction in respiratory infections," said Dr. Bruce Barrett, a UW Health family physician that headed up the research. He goes on to say that, "The bottom line is both the mental health and physical health matter in helping improve (the) flu and cold". The study, which took place during the winter flu and cold season, was conducted on 326 children in China, aged three to five years old. They were given milk containing either one or two probiotic strains twice daily and followed for six months. These two groups were compared with the placebo group, which didn't take any probiotics. Results from this study are impressive. The group taking a single probiotic had 53% less fevers, 41% less coughs and 28% less runny noses than the placebo group. Their illnesses lasted 32% LESS time than the placebo group as well. 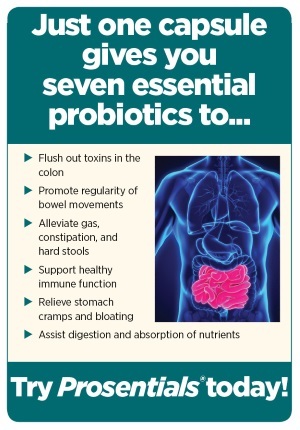 At the same time, the group taking two probiotics had 72% less fevers, 62% less coughs and 59% less runny noses. Their illnesses lasted 48% LESS time than the placebo group... and they used 84% LESS antibiotics compared to the placebo group. 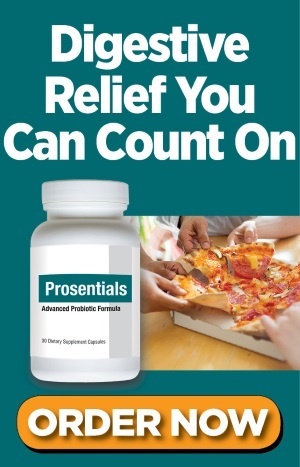 If you're concerned about catching a cold or coming down with the flu, the combination of either meditation or exercise along with taking a probiotic supplement like Prosentials can help. 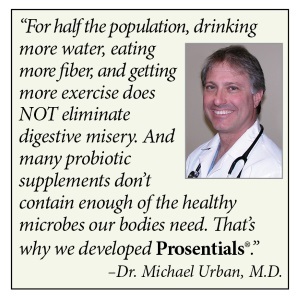 Prosentials is not only important for healthy digestion; it helps promote a healthy immune system as well. 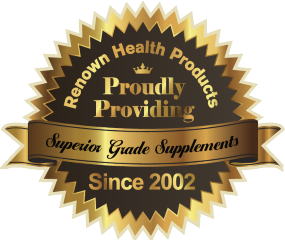 Take it daily for optimal digestive balance and overall health. (1) Miller M, Mangano C, Park Y, et al. Impact of cinematic viewing on endothelial function. Heart 2006; 92:261-262.